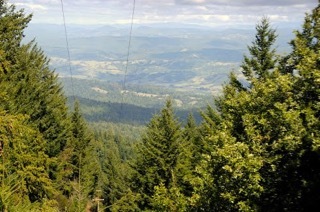 THPBlog: Mendocino Redwood Company to log on steep and unstable slopes between Elk and Philo, CA. Mendocino Redwood Company to log on steep and unstable slopes between Elk and Philo, CA. This THP is about 6.3 miles SE of Elk, CA and 7 miles west of Philo, CA on the Mendocino Coast. Mendocino Redwood Company is planning a tractor and cable logging operation in redwood and Douglas fir forests on steep and unstable slopes at an elevation of 880 to 2,160 feet. There are 9 road failure sites including cut bank failures, fill failures and channeling of the road bed. Mendocino Redwood Company wants to use tractors on steep slopes over 50% grade that do not flatten before reaching a watercourse, use tractors on steep slopes over 65% on existing skid trails, and re-construct 150 feet of existing road inside a class II watercourse. 27 road drainage sites are planned for work including rocking, dip construction, culvert repair/replacement and re-construction of washed out crossings. More information is available on the THP Tracking Center website.